If you like sweet, savory and spicy sandwiches then this breakfast bagel sandwich is for you! Made with a sweet and smokey bacon jam, cheesy scrambled eggs, and spicy pickled jalapeños on a toasted everything bagel with a smear of smokey paprika aioli. Don't eat meat? Try making the jam by leaving out the bacon and doubling the onions for a sweet and smokey onion jam - it's just as good if not better! In a medium-sized saute pan, cook the bacon over medium heat until the fat has rendered out and the bacon is almost crisp. Remove cooked bacon whilst leaving bacon grease in the pan. Add onions and saute until caramelized and soft - about 15 minutes. Add chopped crispy bacon back to the onions and stir in brown sugar. Add vinegar, chili powder, cayenne pepper, coffee, curry powder, and salt and pepper and cook on low for at least an hour and a half or until a thick jam forms. Set aside and refrigerate whatever you don't use. Add eggs, hot sauce, and salt to a small bowl and whisk vigorously until combined. Add butter to a nonstick pan and turn the heat to medium. Add in egg mixture, and continuously stir until eggs start to coagulate and become a thick, chunky custard-like substance. Add the sharp cheddar, turn the heat to low, and continue stirring until the cheese has melted. Add all ingredients to a small mason jar and stir to combine. Refrigerate and use up to two weeks. Toast bagel. Smear both sides with smoked paprika. 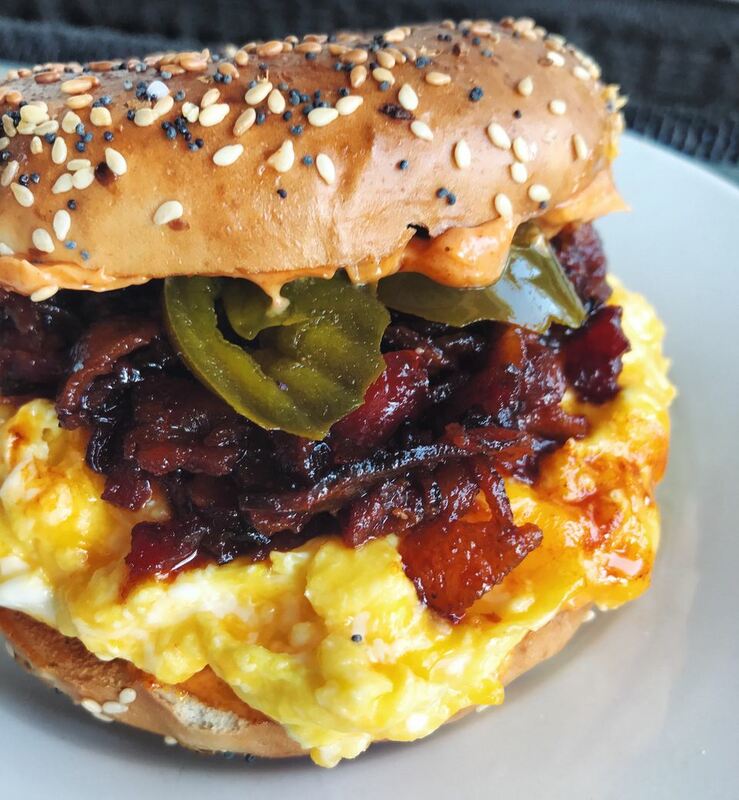 Place the cheesy scrambled eggs, bacon jam, and pickled jalapeños onto to the bottom half of the sandwich and add the remaining bagel half on top. Serve immediately.